When your client is unable to work do to a disability, his or her personal life will not be the only victim. Personal disability plans will keep your clients and their families living comfortably, but what will happen to their companies while your clients are unable to work? Companies need cash flow to pay the rent, keep the lights on, fulfill monthly paychecks and take care of other necessities. If a disability keeps your client from working, his or her company could be forced to close for a short time, or even permanently. Businesses that close temporarily, even for a few months, often cannot regain their footing. PIU offers high limit disability insurance plans to keep your clients’ companies functioning smoothly. Dr. C is married to Dr. J. Dr. J owns the practice. Dr. C is a W-2 employee. They share the expenses of the practice equally. Traditional carriers will not offer Dr. C any Overhead Disability Insurance because Dr. C is not an owner, but an employee. This is not an issue for Petersen International Underwriters. We view the case as it is and insure the obligations of Dr. C, who though an employee has agreed to share the overhead costs. In like circumstances, we also know that traditional disability carriers balk when there are multiple doctors in the same practice and they request Overhead Expense coverage. Petersen International Underwriters can arrange benefits of $1,000 to $100,000 per month or more, so there is no reason your clients should be underinsured. 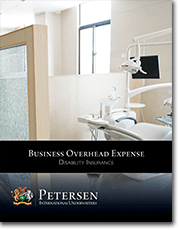 Petersen International Underwriters designed the BOE Insurance plan to continue to pay your client’s company operating expenses during the time he or she is unable to work. If your client’s work is crucial to the company, obtaining a Business Overhead Insurance Plan is highly recommended and responsible. The plan will provide business stability during an unstable time for the company, and help to ensure the company’s clients that despite the hiccup the company is strong and reliable. Business Overhead Insurance takes care of companies when your clients are not able to.